Windows 10 is an entirely new version of the veteran Windows operating system by Microsoft. The latest Windows 10 system, is no longer just an operating system for 32-bit and 64-bit PCs, but also run on the ARM platform for smaller tablets and smartphones. As for media support, Windows 10 gets native support for MKV and High Efficiency Video Coding (HEVC). But still there is no Bly-Ray playback support. But what if you want to play Blu-ray discs in Windows 10 since it still can not play Blu-ray directly? Yeah, with the pulling of suppot for the software in Windows 10, it become more difficult to play BLu-ray discs on your computer. So what are we going to do about it? Read on for details. This article introduces 3 methods to help you watch, open, play Blu-Ray in Windows 10 easily. Other alternatives for playing Blu-ray discs include KMPlayer, which is almost as versatile as VLC Player, and Daum PotPlayer. These apps are free by avoiding the licensing requirements for Blu-ray playback software; instead, the technology has been reverse engineered. Although VLC offers support for Blu-ray media, however, you may have various kinds of problems when playing Blu-ray in Windows 10 with the app. Fortunately, there are several third-party commercial player apps on the market to help you along. 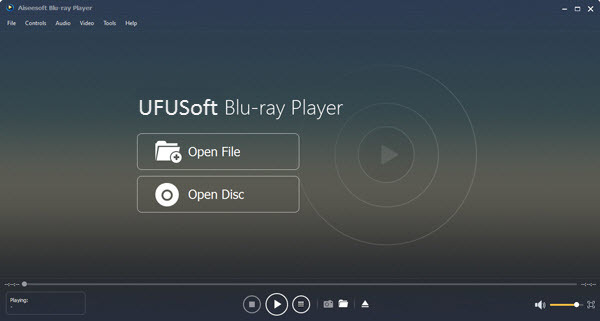 And UFUSoft Windows 10 Blu-ray Player is currenly one of the most useful and professional blu-ray playing software compatible with windows 10, which can help users enjoy any Blu-ray movie (Retail BD disc included) with outstanding and perfect video quality at home. This amazing player can not only play Blu-ray Disc, but also support 4K Blu-ray disc, Blu-ray folder and ISO image files. This Blu-ray Player is reliable and expert in playing Blu-ray discs released in different regions and dates trough simple clicks of mouse. This Windows 10 Blu-ray Player is also capable of playing popular video files. Users can enjoy videos in 4k videos, HD video, AVCHD video, H.264/MP4 AVC, H.265/HEVC, MTS, M2TS, MXF, TS, TRP, MKV, MPEG, FLV, WMV, and MP4, etc. formats. Step 1: Connect the Blu-ray driver to your Windows 10 PC via a USB connection. Besides using the VLC and UFUSoft windows 10 blu-ray player software to play Blu-ray discs in Windows 10, you can also choose to rip Blu-ray discs to digital video formats for playback without any limitation. There are many programs out there that allow you to make copies of your Blu-rays and let you watch them the way you want to view them. One of best options is UFUSoft Blu-ray Ripper (Windows 10 compatible), which is one of the powerful Blu-ray Rippers and converters in the market today. It has the ability to rip convert any commercial and homemade Blu-ray including DVDs to any format that you think of. These formats include AVI, MOV, MKV, M4V, FLV, 3GP, MPG, ASF, VOB, TS, HD MP4, HD AVI, HD MKV, HD WMV, HD MOV, MP3, WAV, AC3, AAC, MKA, OG among others. It Performance is a comparison to a common Blu-ray ripper. By just a single click, you can convert your Blu-ray movies, with fast speed and high quality. It also provides optimized output formats for iPhone (iPhone 8/8 Plus, iPhone X, iPhone 7/7 Plus, iPhone 6s/6s Plus), iPad (iPad mini 4, iPad Air 3), Nokia Lumia, Samsung tablets, LG, HTC smart phones and many other devices. 1. Insert Blu-ray into your BD drive and launch UFUSoft Windows 10 Blu-ray Ripper. 2. Add the files you want to convert and select your preferred output format. 3. Click the Convert button to initiate the Blu-ray ripping for Windows 10 process. When finished locate your output folder and enjoy your movie on Win 10.